Highly reccmended very limited red vinyl 10" on the great Green Cookie label - excellent instro surf the type of record you'll play over and over again! Surely these four boys have created an "Agamemnonz"-sound, new and inimitable. The phrasing of their guitars, their musicality, the originality of their arrangements, supported by a subtle rhythm, is the secret of the stunning success of these boys through the entire world. 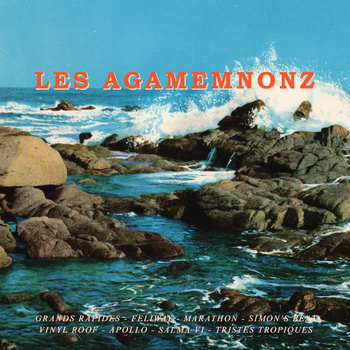 Benjamin Bonaventure (lead guitar); Simon Ripoll-Hurier (rhythm guitar); Lucas Morin (bass); André Pasquet (drums); Recorded, mixed and mastered by Yann Jaffiol at MyStudio (Nantes, France); Engineered by Le Suédois; Cover artwork by studio Ludwig; Group photo by G. Alarm; Translation by Iris Touliatou.